Up is a fully computer animated feature film created by Pixar and Disney. 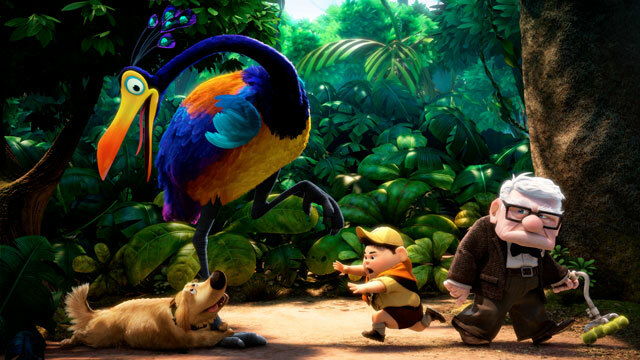 It is an adventure film, and like all Pixar films, it is meant for the entire family. The story is about an old man named Carl Fredricksen, voiced by Ed Asner, trying to achieve his dream of one day going to South America. He attaches thousands of balloons to his house to make it fly. Mistakenly, a little boyscout named Russell tagged along. As the two adventure on, they meet new friends and enemies, that will help them and hinder them on their journey. Up is a very emotional film. At the very beginning of the film it shows a montage of Carl Fredricksen and his wife’s life. There are two extremely sad moments in the montage that that will leave a grown man crying, myself included. Even multiple viewings still make me tear up a little. Then through out the rest of the film, Carl comes up agents struggles that are hindering him from achieving his dream. These moments are also very emotionally overbearing. Little Russell talks very briefly about his personal life, and it is very sad. The friends that Carl and Russell meet up with also have problems of being hunted and outcasted by others. If I had to fault Up for anything, it would be the evil old man villain story line. I felt that was much weaker than the rest of the films plot. It was kind of weird to have an evil old man villain, contrasting with a emotional journey to achieve someones dreams. I understand that they needed a major conflict in the film, but I think they could have come up with something better. Maybe Pixar should have extended the journey itself and made it a bigger conflict than it already was. Like all Pixar films, the art direction and animation was outstanding. They created a very interesting world that was familiar but different. The character designs are stylized enough that they will never look out of date. These things make this film an instant classic. It is sadly not my favorite film created by Pixar, but it is many unique qualities that separate it from the rest of the collection. I would have to place Up on the top half of my list of favorites out of the 10 best picture nominees. I am happy this film is nominated for best picture because it is very rare for animated features to be nominated. Up is only the second ever to be nominated, Beauty and the Beast being the first.